Churchill's "Few" were central to national survival during the Battle of Britain, and the morale of millions was sustained through their heroism -- a potent propaganda victory within a military success. CBI - China: Day 69 of 142 of the 1st Battle of Hebei. Spain: Day 237 of 985 of the Spanish Civil War. At Guadalajara, the Nationalists attack the Republican troops in two columns. The west side meets little resistance while the other side runs into stiff resistance. Germany: Adolf Hitler orders his military leaders to review CASE OTTO for the invasion of Austria. Spain: Day 602 of 985 of the Spanish Civil War. CBI - China: Day 247 of 2,987 of the 2nd Sino-Japanese War. Day 32 of 124 of the Battle of Henan. USSR: Stalin postulates a kinship between Nazism and Communism in his radio speech. Czechoslovakia: Czech President Emil Hácha orders the arrest of Slovakian political leader Jozef Tiso. Spain: Day 967 of 985 of the Spanish Civil War. CBI - China: Day 612 of 2,987 of the 2nd Sino-Japanese War. Finland: Day 102 of 105 of the Russo-Finnish War. MTO - Italy: The German Foreign Minister meets with Mussolini in Italy to inform him of Hitler's upcoming invasion of France and wants him to join. Mussolini says he will as soon as he feels Italy is ready. CBI - China: Day 978 of 2,987 of the 2nd Sino-Japanese War. Day 117 of 381 of the Battle of South Guangxi. Day 43 of 67 of the Battle of Wuyuan. 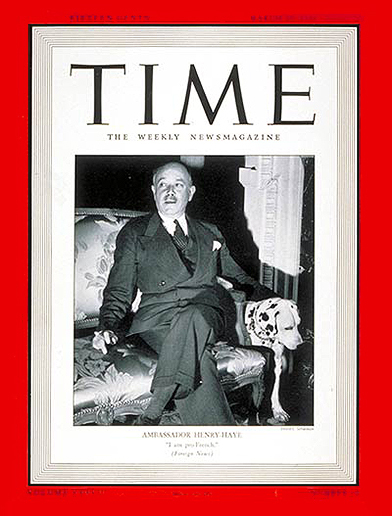 USA: Vichy France Ambassador to the United States Gaston Henry-Haye is featured on the cover of Time Magazine. 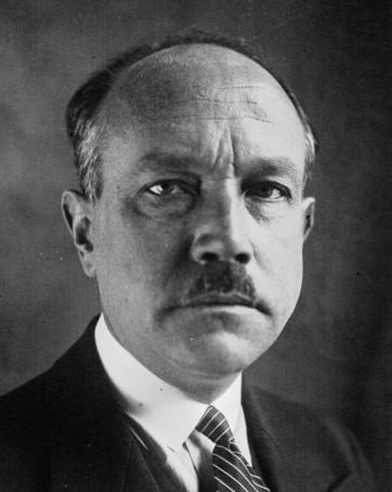 Following the 22 Jun 40 fall of France and the establishment of a Nazi-friendly government in Vichy, France, chief of state Marshal Philippe Pétain appointed Gaston Henry-Haye as ambassador to the United States. On this date, 10 Mar 41, he was featured on the cover of Time. That in itself hardly warrants this "spotlight" on the man, but what happened the following year does, when Henry-Haye was interned by the United States government until 1944. This internment of a diplomat was certainly unusual, especially considering that no state of war existed between Vichy France and the United States. Vichy France had broken off relations with the US, but no state of war existed yet. Pearl Harbor was another nine months away . Henry-Haye's internment was a courteous one and he was eventually allowed to return to Vichy France in 1944, but he escaped to South Africa after hearing of threats of death by the French Resistance. Henry-Haye did not return to France until 1950. Atlantic: German sub U-552 sinks Icelandic trawler REYKJABORG, killing 12. Of the 3 survivors, one of them will die before being rescued four days later. Atlantic: British submarine HMS H28 is damaged during a collision with a freighter in the Irish Sea. ETO - UK: Day 186 of 258 of the Blitz. German bombers attack Portsmouth, killing 10 people on shore, sink the minesweeper HMT REVELLO and damage 8 other ships. ETO - France: The RAF attacks Le Havre, giving their new 4-engine Halifax bomber its debut, one Halifax is shot down on its return flight by an RAF night fighter. MTO - Libya: The German 5th Panzer Regiment arrives in Tripoli. MTO - Libya: British submarine HMS UNIQUE sinks the Italian ship FENICIA 100 miles northwest of Tripoli. East Africa: Day 274 of 537 of Italy's East African campaign in the lands south of Egypt. The British Nigerian Brigade engages Italian units at Degehabur, Abyssinia, about 100 miles south of Jijiga. East Africa - Eritrea: Day 34 of 56 of the Battle of Keren. CBI - China: Day 1,343 of 2,987 of the 2nd Sino-Japanese War. CBI - Thailand: Day 161 of 221 of the Franco-Thai War (Vichy France vs Thailand). USA: The US Marine Corps purchases the 132,000 acre Santa Margarita Ranch north of San Diego, California, to build the famous Camp Pendleton. Atlantic: Day 56 of 169 of Germany's Second "Happy Time," during which U-boats sink 609 Allied ships with little risk. German sub U-588 sinks US tanker GULFTRADE just off Toms River, New Jersey. Russian Front - North: Day 184 of 872 of the Siege of Leningrad. Russian Front - North: Day 31 of 102 of the Battle of the Demyansk Pocket, another failed attempt to break the siege at Leningrad. Russian Front - North: Day 47 of 103 of the Battle of the Kholm Pocket. Another attempt to break the siege at Leningrad. Russian Front - Center: Day 62 of 103 of the Battle of Vyazma, Russia. Russian Front - Center: Day 62 of 103 of the Battle of Sychevsk, Russia. Russian Front - Center: Day 8 of 49 of the Battle of Rzhev, Russia, a diversion to pull more German troops away from Moscow. Russian Front - South: Day 132 of 248 of the Siege of Sevastopol, Crimean Peninsula. All German attacks against Sevastopol are shut down for the winter. PTO - Philippines: Day 93 of 152 of the 1st Battle of the Philippines. 5th Air Force provides air support. US Army General MacArthur receives another order for him to evacuate the Philippines. PTO - New Guinea: Day 3 of 6 of the 1st Battle of Lae-Salamaua. Warplanes from the US carriers LEXINGTON and YORKTOWN attack the Japanese at Lae and Salamaua. The Japanese land additional troops at Finschhafen while their planes attack Port Moresby. CBI - Burma: Day 87 of 164 of Japan's Invasion of Burma. CBI - China: Day 1,708 of 2,987 of the 2nd Sino-Japanese War. Day 77 of 99 of the 3rd Battle of Changsha. CBI - Java: Day 11 of 13 of the Battle of Java. PTO - Borneo: Day 85 of 107 of the Battle of Borneo. PTO - Malaya: Day 20 of 357 of the Battle of Timor Island. PTO - New Guinea: The Japanese occupy Buka in the Solomon Islands. ETO - UK: US 8th Air Force: The 4th Fighter Group flies Channel patrols, almost half of them are in P-47s as they are transitioning from the borrowed Spitfires. Germany: The Gestapo sends 11 Polish men and 11 Polish women from Bielsko, Poland to the Auschwitz Concentration Camp. Russian Front - North: Day 549 of 872 of the Siege of Leningrad. Russian Front - North: Day 29 of 51 of the USSR's Operation POLAR STAR, a failed offensive north of Leningrad, hoping to take the southern shore of Lake Ladoga, Russia. Russian Front - North: Day 310 of 658 of the Siege of the Kholm Pocket, USSR lays siege to the Kholm Pocket but the Germans hold out for a about a year and a half. Russian Front - Center: Day 9 of 30 of the 3rd Battle of Rzhev-Sychevka, Russia. Russian Front - South: Day 20 of 25 of the 3rd Battle of Kharkov, Ukraine. MTO - Tunisia: Day 114 of 178 of the Battle of Tunisia. RAF and US Air Forces provide Allied air support. Axis troops fall back to the Mareth Line. CBI - Burma: Day 80 of 104 of the 1st Battle of Arakan. US 10th Air Force provides air support. The British Chindits destroy the rail bridge at Kyaikthin and crosses the Irrawaddy River. CBI - Burma: Day 31 of 79 of the Allied Operation LONGCLOTH. CBI - China: Day 2,073 of 2,987 of the 2nd Sino-Japanese War. The US 14th Air Force is activated to serve the China-Burma-India Theater. Major General Claire L Chennault is named Commanding General. PTO - Alaska: Day 277 of 435 of the Battle of Kiska, Aleutian Islands. US 11th Air Force warplanes attack enemy positions on Kiska Island. Atlantic: The Icelandic airline Lofteide HF is founded, which will inaugurate its initial service on 07 Apr 44. Atlantic: HMS ASPHODEL is torpedoed and sunk by German sub U-575 while escorting a convoy near Greenland. Germany: 1,501 Jews arrive at Auschwitz Concentration Camp from Paris. Only 110 men and 80 women are registered while the remaining 1,311 are sent directly to the gas chambers. Germany: Heinrich Himmler lifts various laws against Jewish and Roma people as their "evacuation and isolation" has already been achieved. Russian Front - North: Day 38 of 191 of the Battle of the Narva Isthmus, Estonia. Both German and Soviet troops in the Baltic region go on the defensive. Russian Front - South: Day 78 of 113 of the USSR's Dnieper-Carpathian Offensive in southwestern Ukraine. Russian Front - South: Day 7 of 45 of the Battle of Chernovtsy, Ukraine. Russian Front - South: Day 5 of 44 of the Battle of Snigirevka, Ukraine. MTO - Italy: Day 54 of 123 of the Battle of Monte Cassino. RAF and US Air Forces provides air support for the Allied ground troops. MTO - Italy: Day 49 of 136 of the Battle of Anzio. RAF and US Air Forces provides air support for the Allied ground troops. CBI - Burma: Day 72 of 99 of the 2nd Battle of Arakan. CBI - Burma: Day 6 of 166 of the UK's Operation THURSDAY. CBI - Burma: Day 1 of 147 of the Battle of Myitkyina. CBI - China: Day 2,439 of 2,987 of the 2nd Sino-Japanese War. CBI - India: Day 3 of 118 of the Battle of Imphal-Kohima. Japanese troops invade India from northern Burma. PTO - Marshall Islands: US 5th and 7th Air Forces attack targets in the Marshalls. PTO - New Guinea: Day 11 of 80 of the Battle of the Admiralty Islands. 5th Air Force provides air support. PTO - New Guinea: Day 174 of 219 of the Battle of Shaggy Ridge. US 13th Air Force provides air support. The Battle of Hill 700 goes into its third day. PTO - New Guinea: Day 87 of 597 of the Battle of New Britain. 5th Air Force provides air support. PTO - Solomon Islands: Day 131 of 295 of the Battle of the Bougainville Islands. US 13th Air Force provides air support. PTO - Japan: US 20th Air Force: Day 2 of 2 of Operation MEETINGHOUSE. 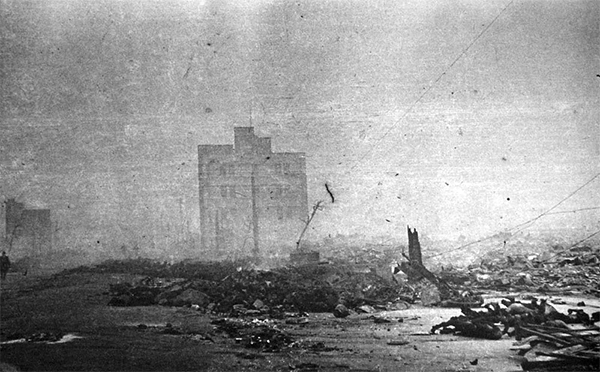 B-29s fire bomb Tokyo, destroying 267,171 buildings (about one-fourth of the city), killing 83,793, wounding 40,918 and leaving countless homeless. 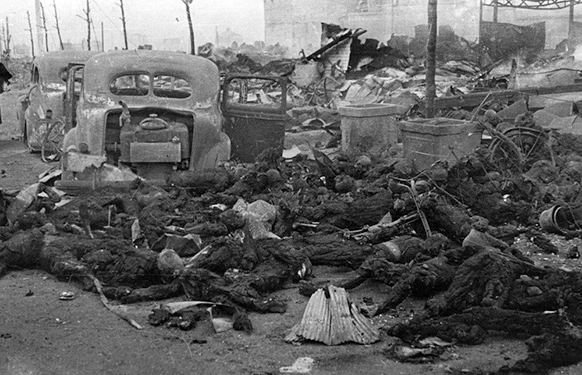 Strategic bombing and urban area bombing of Japan began in 1944 after the long-range B-29 Super Fortress bomber entered service, first employed from China and thereafter the Mariana Islands. B-29 raids from those islands commenced on 17 Nov 44 and lasted until 15 Aug 45, the day Japan capitulated. This Operation MEETINGHOUSE air raid of 10 Mar 45 was later estimated to be the single most destructive bombing raid in history. ETO: German POWs tunnel out of a camp at Bridgend, Wales. All 70 are captured within a week, including two who are caught by an unarmed girl working with the Auxiliary Territorial Service. ETO - France: Day 222 of 284 of the Battle of Brittany. ETO: Day 50 of 66 of the Battle to the Rhine. Day 4 of 20 of the Battle of Ramagen. US 9th Air Force provides air support. The Germans evacuate Wesel on the lower Rhine as US 3rd Army captures Bonn. ETO - Germany: Day 4 of 46 of the Battle of the Ruhr Pocket. Allies will go on to take the Ruhr area in Germany in a battle of encirclement that will mark the end of major organized resistance on Nazi Germany's Western Front. We stumbled upon this wonderful photo back in 2011 and slated it to use on March 10 as a Day-By-Day spotlight. But a mystery has presented itself. "Easter morning, T/5 William E. Thomas...and Pfc. Joseph Jackson...will roll specially prepared eggs on Hitler's lawn. March 10, 1945." 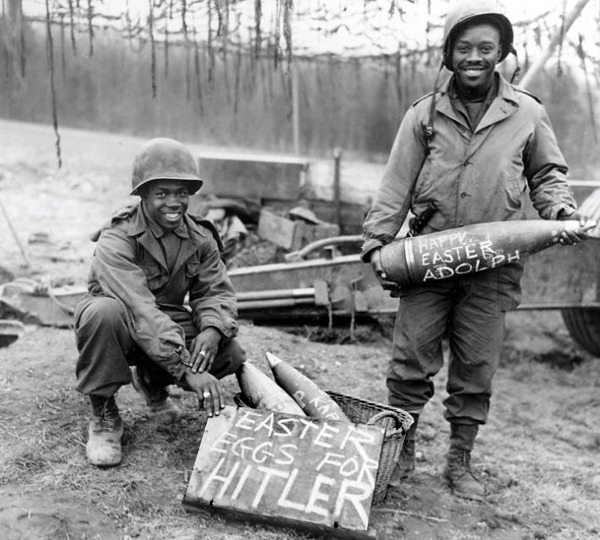 "Cpl William E Thomas and Pfc Joseph Jackson prepare a surprise for German troops on Easter morning, 1945." "...on Easter Morning, March 10, 1945." One of two possibilities exist. Either the March 10th date has been wrong all along, or for some reason the photo was actually taken three weeks before Easter. One google result stated that "this was originally a propaganda picture released in the hopes of recruiting more African-American soldiers to join the 92nd infantry, under General Edward Almond." If that's true, then perhaps the photo was staged three weeks before Easter. And if so, there might be no reason for it to have been taken near the front lines in the ETO. It could have been taken anywhere, even stateside. Regardless, it is a great photo and gives us a chance to reflect on the contributions of African-Americans in WWII, fighting to preserve liberties that were denied them by their own nation. We've added this photo as a Day-By-Day spotlight for April 1st as well as here. ETO - France: Day 223 of 284 of the Battle of Brittany. ETO - France: Day 177 of 236 of the Siege of Dunkirk. ETO: Day 51 of 66 of the Battle to the Rhine. Day 5 of 20 of the Battle of Ramagen. US 9th Air Force provides air support. ETO - Germany: Day 19 of 36 consecutive RAF night raids on Berlin. ETO - Germany: US 8th Air Force B-17s and B-24s bomb rail targets in Germany. Russian Front - Finland: Day 177 of 223 of the Lapland War. Finland and Russia have joined forces to kick the Germans out of Finland's most northern province. Russian Front - Center: Day 147 of 206 of the Battle of the Courland Pocket in Latvia. Russian Front - Center: Day 45 of 75 of the Battle of Königsberg, East Prussia (now Kaliningrad, Russia). Russian Front - Center: Day 44 of 63 of the Battle of the Heiligenbeil Pocket in East Prussia. Russian Front - Center: Day 29 of 54 of the Battle of East Pomerania, Germany. The Soviets heading toward Danzig capture Zoppot. Russian Front - Center: Day 26 of 83 of the German Siege of Breslau (today Wroclaw, Poland). Russian Front - Center: Day 7 of 15 of the Battle of Kolberg, Germany (today Kolobrzeg, Poland). Russian Front - South: Day 5 of 11 of the failed German Operation FRÜHLINGSERWACHEN (Spring Awakening) at Lake Balaton, Hungary. The idea was to destroy their oil fields. Russian Front - South: Day 5 of 16 of the Battle of Drava (a river in Bulgaria). Germans attack the Bulgarians, hoping to distract the Soviet advance on Berlin. CBI - Burma: Day 51 of 61 of the Battles of Meiktila and Mandalay. The US 10th Air Force provides air support. British and Commonwealth troops isolate the Japanese garrison at Mandalay. CBI - Burma: Day 35 of 99 of the Battle of Pakokku and Irrawaddy River operations in central Burma. The US 10th Air Force provides air support. CBI - China: Day 2,804 of 2,987 of the 2nd Sino-Japanese War. CBI - Malaya: US 20th Air Force B-29s bomb the marshalling yard at Kuala Lumpur. PTO - Alaska: US 11th Air Force B-24s bomb targets at Kataoka on Shimushu Island and Suribachi and Kakumabetsu on Paramushiru Island. PTO - Japan: Day 20 of 36 of the Battle of Iwo Jima. US 7th Air Force provides air support. PTO - New Guinea: Day 439 of 597 of the Battle of New Britain. US 10th Air Force provides air support. PTO - New Guinea: Day 323 of 481 of the Battle of Western New Guinea. US 10th Air Force provides air support. PTO - Philippines: Day 142 of 299 of the 2nd Battle of the Philippines, aka the Liberation of the Philippines or the Philippines Campaign. PTO - Philippines: Day 86 of 244 of the Battle of Luzon. 5th Air Force provides air support. PTO - Philippines: Day 1 of 159 of the Battle of Mindanao Island.